As the temperatures drop, there’s nothing quite like a bowl of hot soup to warm the cockles of your heart (and your belly)! One of the great things about autumn is the wealth of squash options to choose from. 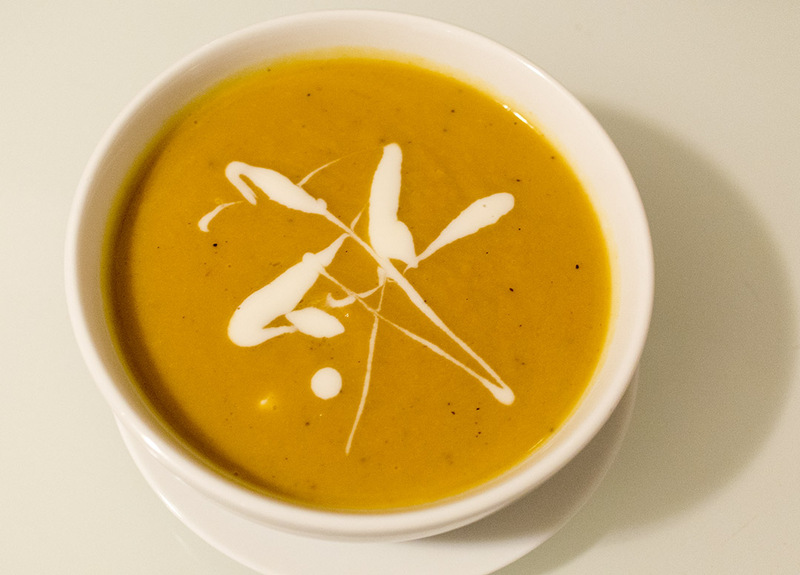 We’ve already tried several variants of butternut squash soup, which is always a classic, but when David brought home pumpkin one day, I thought it might be nice to try something new. Preheat oven to 425 F. If you’re using a whole squash, cut in half, scoop out the innards, and rub the exposed flesh with a little olive oil. If you’re using peeled and cut squash, just toss with a little oil. Sprinkle squash with pinch of salt, put on baking sheet and slide into oven. Whole squash will need to roast for 60-75 minutes, cut squash for about 45 minutes. When you can pierce the flesh easily with the tip of a knife, it’s ready to come out of the oven. As soon as it is cool enough to handle, peel it and cut it into cubes, about 2″ on a side. Warm 2 tbsp olive oil in soup pot over low heat, then stir in the onions. Season lightly with salt and cook for 5 minutes, or until onions start to soften but not colour. Add the fennel, celery, garlic and a pinch more salt and cook, stirring often, for another 5-10 minutes, or until all vegetables are soft but still pale. Stir in ginger, cumin, nutmeg and ¼ tsp salt, and a few grinds of pepper, then add the roasted squash. Pour in 5 cups broth, increase the heat, and bring to a boil, then reduce the heat so the soup simmers gently. Add the pears and orange peel. Partially cover the pot and simmer for about 20 minutes, or until the pears and squash are soft enough to be mashed with the back of a spoon. Puree the soup in batches in a blender or food processor. Taste for salt and pepper. If soup is too thick for you, stir in up to 1 cup more broth and reheat until hot. Ladle soup into bowls and finish with a little lemon juice or serve with lemon wedges. Garnish with cream, if you like. A few notes on preparation: We used pumpkin (about 3 lbs). Instead of a Spanish onion and spring onion/shallot, we used a red onion and increased the amount of garlic from 1 clove to 4. We also increased the amount of spices upon tasting to give it a bit stronger flavour. We had Asian pears, which are smaller than your average supermarket pear, so we used 4 Asian pears. We did not squeeze lemon juice before serving. After having such a delicious classic as butternut squash soup, I wasn’t sure how this would hold up in comparison. It was, however, a lovely soup–a different enough from the butternut squash to make it worth having. We noted that it didn’t have a particularly strong pear flavour, which could have come from our using Asian pears instead of more traditional Bosc or Anjou pears. We would definitely change the pear type and increase the amount of pear next time. It wasn’t completely smooth, with a great texture from the squash. The fennel added a nice sweetness against the almost curry flavour from the cumin. Definitely one to try with different kinds of squash, as the type of squash can vary the flavour substantially.